Easily the coolest weapon on UFO, Sky One [above] was the backup defense against alien spacecraft that made it past the Moonbase interceptors. 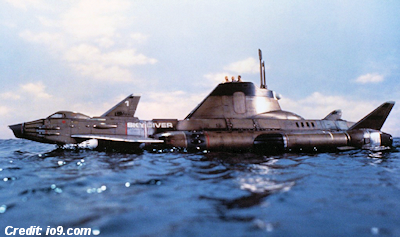 It was a stubby delta-wing jet fighter launched from an attack submarine called Skydiver. Yes, this classic show created by Gerry and Sylvia Anderson had its share of late-'60s, early-'70s schlock, such as military officers whose mini-skirt uniforms included purple wigs. But U.F.O also had strong characters, nuanced plots and extremely cool technology that, in retrospect, was decades ahead of its time. For those of you who may be unfamiliar with U.F.O (and, if so, what the hell is wrong with you? ), the series is set in the year 1980, when a global organization called S.H.A.D.O. (Supreme Headquarters Alien Defense Organization) is waging a secret war against extraterrestrials who are periodically launching attacks on Earth. S.H.A.D.O. has constructed a multi-layered defense system (portrayed in the opening credit sequence below) consisting of an early warning satellite, a Moon base that launches Interceptor fighters, a high-speed jet launched from a submarine (Skydiver) and ground-based mobile units.